Artisan of Creative Miracles: Day 6--Origami! 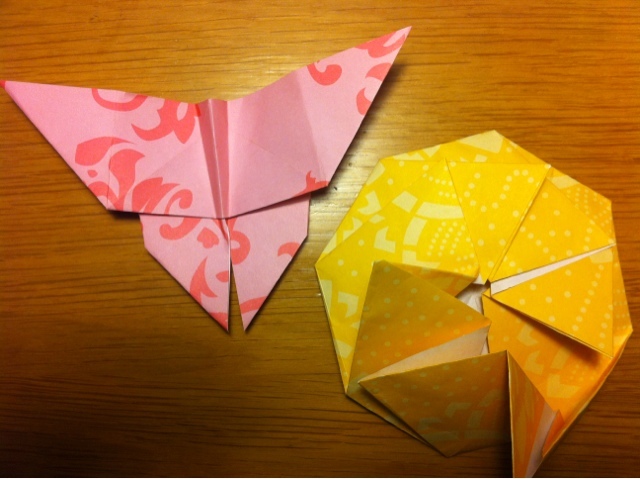 I have always been attracted to Origami. I picture myself serenely folding beautiful papers into fascinating shapes. Then comes reality. The directions are never as clear as it seems they should be. I fold and unfold and refold until the paper looks more like Calvin's rejected homework than some recognizable shape. Today, however, I prevailed...mostly. The yellow tato went a bit wonky at the end, but I am pleased with my efforts. I shall attempt this again!